A columbarium is a place where the cremated remains of an individual may be interred. Common in ancient times, cremation came back into practice in the mid-1800's. Currently 20% of Americans use cremation, but projections are that between 40% and 50% of people in this country will opt for cremation by mid-century. 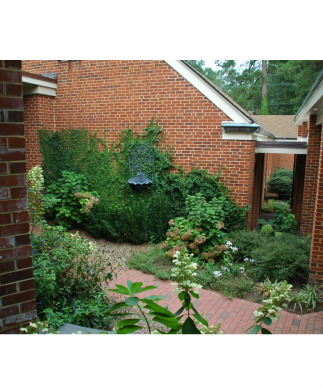 Many columbaria are located in garden-like settings on church grounds or cemeteries. A few churches incorporate them into the interior of buildings. The practice of having a columbarium on church grounds relates to the age-old practice of churches being the custodians of cemeteries. It further affirms the concept that the church supports its members throughout all of life, death included. 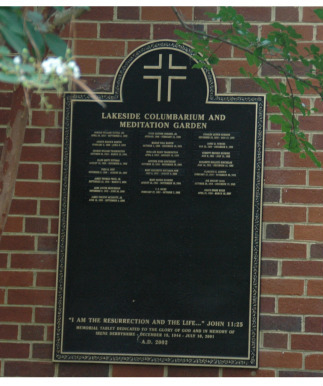 Lakeside dedicated its Columbarium on All Saints Sunday 2002. It consists of two walls holding seventy-five niches. A marble altar in the center of the garden is used for inurnment services. In addition, three benches, donated by members of the congregation provide a place to sit, reflect, and appreciate the beauty of this sacred space. 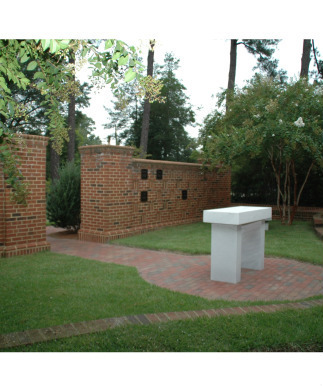 To request more information about our Columbarium click here.